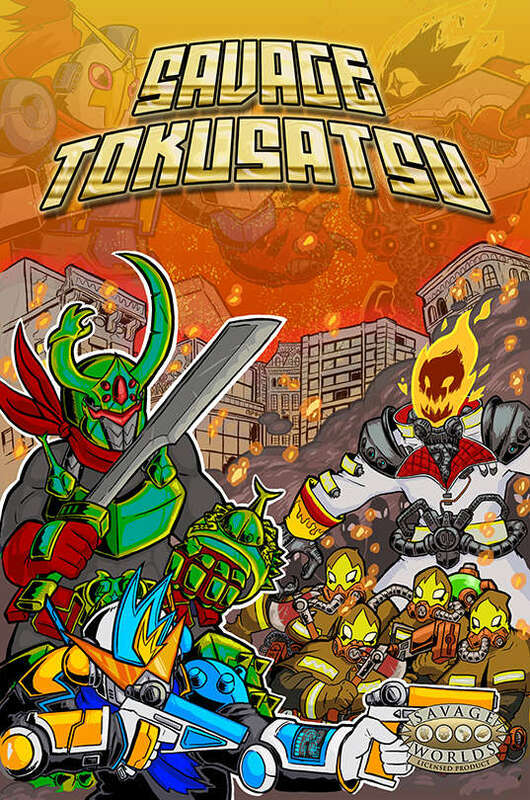 Savage Tokusatsu is a game built from the ground up specifically for the Savage Worlds Adventure Edition roleplaying game. Within the pages of this book are new rules and character options to help you capture the feel of any tokusatsu story in the collaborative storytelling experience that is tabletop roleplaying. You can be the transforming team of heroes working together to control a giant mech simultaniously. You can play the desperate humans trying to halt the advance of an unstoppable kaiju that towers above skyscrapers. All this and more is possible with Savage Tokusatsu! Within the pages of Savage Tokusatsu you'll find entirely new systems for running your favorite colorful transforming heroes, controlling giant robots, and building superweapons to repel giant monsters. What Are You Waiting For? The World Needs You! This is the FULL GAME. We also have a Test Drive that provides a limited selection of new rules for running and playing in transforming hero games. Several sample Edges, Hindrances, enemies, and equipment options are presented in the pages of the Test Drive.